Supporters Meet in Annapolis to Protest Premise that Corporate Candidate is "Not a Human Being"
The campaign of the first corporation to run for Congress has shaken the political establishment across state and party lines. 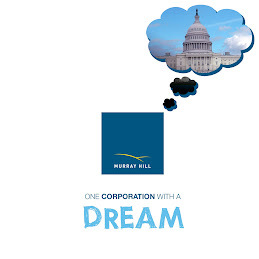 In the latest development, the Maryland State Board of Elections rejected Murray Hill Inc's application to register as a Republican in Montgomery County, so that the corporation can run in the party primary for Congress in Maryland's 8th Congressional District. On Wednesday, March 24, at 12:30 PM, Murray Hill Inc will formally appeal this ruling by submitting a request to the Maryland State Board of Elections, 151 West Street, Suite 200, Annapolis MD. The corporation's "astroturf" supporters are expected to be on hand as Designated Human Eric Hensal and Campaign Manager William Klein file the appeal. The campaign is a guest on KCRW's "To the Point"
Designated Human Eric Hensal just appeared on KCRW's "To the Point." Here is a link to the podcast. Our portion begins at 25 minutes into the show. Update: Maryland rejects our voter registration. It is disappointing to report that the state of Maryland rejected our application to register to vote. In a clear bias towards bodied persons, the state does not believe we have the right to register. But this is only the first step in our stand for corporate civil rights. We are sure you agree, our campaign is at the forefront of an historic movement that will eventually win all the rights our founding fathers meant for corporations to have. We will not be deterred in our efforts and will continue moving forward. With the state's response in hand, we will formulate our legal response to this rejection shortly. For your information, the county and state communications are posted for your review. Just a quick post with a link to the NPR All Things Considered interview with Designated Human Eric Hensal on Tuesday March 16, 2010. Also, the corporation wants to thank the staff at public radio station WTMD in Towson, Maryland for the studio time that made the interview possible. Here is a link to the Washington Post front page story! There is a great deal of internet traffic regarding the "age" of Murray Hill Inc. We understand that after the U.S. Supreme Court so strongly recognized corporate personhood, our political campaign is breaking new, and sometimes awkward, ground in how this personhood operates in a world biased towards bodied persons. The age question is the most common brought against our effort. The U.S. Constitution requires a person be at least 25 years old to run for Congress. Murray Hill, our detractors say, is only a few years old, therefore, we cannot run for office. We would like to take this opportunity to discuss, briefly, how the rights recognized in the Citizens United decision are to be implemented in this anti-corporate climate. The Supreme Court did not create a new class of corporate persons. Instead, the majority simply recognized that a person-under-the-law has two manifestations--bodied and corporate. What we are facing today is analogous to issues addressed by the Americans with Disabilities Act--how to make the political process truly accessible to corporate persons in a way our founding fathers wanted us to have? The constitution does not define how to calculate age, but simply states a minimum age. Corporations are not bodied persons because we are complete from day one and do not have a meaningful age in any way a bodied person would calculate. No infancy, no immaturity, no waiting until a corporation is 21 to buy beer. There is also no distinction between corporations on the basis of age, so a corporation does not ask an older corporation to buy beer on its behalf. Since the Supreme Court has decided that corporations have just as much right as other “persons” to spend what they like to influence elections, a group of liberal activists reasons, why couldn’t a corporation just skip a step and run for political office itself? Anyway, that’s what the folks think at Murray Hill Inc., an advocacy and media firm in Silver Spring, Md., with a client list mainly of liberal activists. The company has filed candidacy papers to run as a Republican in the Montgomery County congressional district represented by Democrat Chris Van Hollen. The firm’s president, Eric Hensal, says he’s franchising the tools for candidacy and encouraging other “corporate persons” to run for office. The first franchisee is Computer Umbrella Inc. of Sterling, Va., which is plotting a House run.